FORMULA ONE: Lewis Hamilton cruised to an easy victory at the French Grand Prix to resume leadership of the drivers championship standings. Hamilton led from lights to flag, with not his pit stop nor a safety car period enough to knock the Briton of course to win his third race of the season. “I feel very grateful for a solid weekend,” Hamilton said. “My guys are just continuously pushing the boundaries and never giving up, so I’m just forever grateful for all of their work. The Mercedes driver assumed a 14-point lead over title rival Sebastian Vettel in the championship standings. The race started chaotically despite the mass of run-off area at the Circuit Paul Ricard. Sebastian Vettel, who had executed a strong start from P2 only to be boxed in by Hamilton ahead and Valtteri Bottas to the right, locked up into the first turn and nudged the Finn off the track, damaging his front wing and giving the Mercedes car a rear-left puncture. The German was penalised five seconds for causing the collision. Through the carnage scythed Max Verstappen, who cut across the run-off area to seize second place from his crashed-out rivals. Behind him French drivers Pierre Gasly and Esteban Ocon also crashed, putting both out of the race on the spot. The debris from both accidents triggered a safety car, behind which Vettel and Bottas could pit for new soft tyres – the most durable rubber available at the weekend – and rejoin at the back of the field to mount mammoth comeback drivers. Vettel, his Ferrari undamaged, made short work of the entire midfield, coming from 17th to fifth in just 14 laps to put himself within striking distance of the podium. Bottas, however, had a tougher time of things thanks to floor damage picked up dragging his punctured car to the pits on the first lap. It left him languishing in the lower points-paying places. Vettel temporarily earnt a position at the first pit stop window when Daniel Ricciardo, running in third, emerged from pit lane behind the Ferrari on lap 29, but the Australian rectified the situation with his fresher tyres five laps later to resume his place on the podium. By lap 40, having ceded position to teammate Kimi Raikkonen, it was clear that Vettel’s tyres wouldn’t make the distance. 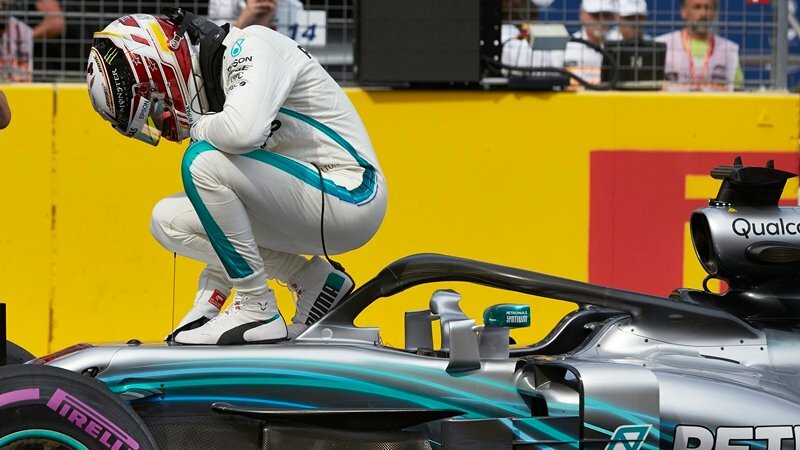 Bottas, who had made it up to sixth place on the same strategy, was likewise suffering and stopped on lap 40, and a slow stop for the Finn allowed Vettel to make his tyre change and serve his five-second penalty without losing further places. Ferrari’s podium hopes fell back to Raikkonen, who was boosted by Ricciardo suffering debris damage to his front wing, slowing the Red Bull Racing car enough to enable the Finn to cruise past him for third place on lap 47. Verstappen was next in second place, but the Dutchman, having cruised in place since the first-lap carnage, was some 20 seconds up the road and unreachable. Verstappen was relaxed in second place, aware that Hamilton’s pace was never matchable in his Renault-powered Red Bull Racing car. Ricciardo finished fourth ahead of Vettel in fifth. Haas’s Kevin Magnussen recorded his fourth points-paying finish in sixth, the Dane proving just out of reach for Bottas, who took home six points for seventh place. Carlos Sainz finished eighth for Renault at the team’s home grand prix, but the Spaniard was entitled to more having run in sixth until his power unit developed a problem with four laps to go, dropping him two places. His teammate, Nico Hulkenberg, scored two points in ninth and just 1.8 seconds ahead of Sauber’s Charles Leclerc, who scored his fourth points-paying finish in five races. Don't forget to listen to Live89.5 each and every Saturday at 9am and 5pm for the Box of Neutrals radio show.